Madanach, also known as the King in Rags, is a Breton witchblade and the leader of the Forsworn Rebellion. He once ruled all of the Reach as king, although only for a short time. Taking advantage of the Empire's preoccupation with the Great War, in 4E 174, he led the uprising to drive the Nords from power in the Reach. According to historians, this brief period of Reachman independence was peaceful, with only the cruelest Nord landowners being put to death, and the nascent kingdom made overtures seeking formal recognition from the Empire. However, Igmund, son of the jarl that Madanach's forces had overthrown and killed, eager to reclaim the Reach, accepted an offer from Ulfric Stormcloak to retake it with his militia in exchange for the reinstatement of Talos worship in the Reach. 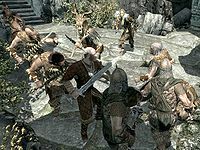 Ulfric succeeded in 4E 176, when he successfully besieged the capital of the Reach, Markarth, capturing Madanach in the process. He is now imprisoned in Cidhna Mine deep inside Markarth. He spends his whole day in his own private cell area which is guarded by Borkul the Beast. His private cell has a bed, the only one in the mine, a desk which is used to write orders to the Forsworn, and an unused chest. 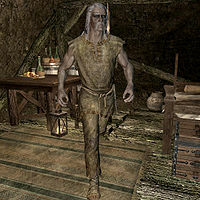 He wears a roughspun tunic and footwraps, he carries a shiv, skooma, his key and a note. He can use the following spells: Ice Storm, Steadfast Ward, Conjure Frost Atronach, Icy Spear, Frost Cloak, Stoneflesh and Ice Spike. When you first meet him in his private cell he will greet you with "Well, well. Look at you. The Nords have turned you into an animal. A wild beast caged up and left to go mad. So, my fellow beast, what do you want? Answers about the Forsworn? Revenge for trying to have you killed?" Let's start with revenge! : "Very well. Come for me, then. Come and let's end this!" If you choose revenge he will become hostile, along with any other Forsworn nearby, and attack you. I want my freedom. : "Your freedom? Yes. But even if you were to escape Cidhna Mine, your name would still be stained with all that blood." You have a lot to answer for. : "Do I? And what about you? What right did you have to meddle in my affairs? Kill my people? Was it worth it? Your truth?" He will follow this up with "You're one of us now, you see? A slave. The boot of the Nord stepping on your throat. Maybe if you understood that, I could help you." Telling him you don't need his help will have him say, "So many say that, at first, until they realize the truth.If you change your mind, speak to Braig. Tell him I sent you. I want you to know how widespread the injustice of Markarth is." If you ask for help he will reply, "There's a man named Braig inside these mines. Besides me, he's been here the longest. Tell him I sent you. Ask him why he's here. I want you to know how widespread the injustice of Markarth is." You will then have the option to ask him about the Forsworn and Thonar Silver-Blood. He will tell you the whole unfortunate story by saying, "I had Markarth. My men and I drove the Nords out. We had won, or so we thought. Retribution was swift. I was captured, quickly tried, and sentenced to death. But my execution never came. Thonar Silver-Blood stopped it. He wanted the Forsworn at his call, that I would point their rage at his enemies and spare his allies." He will then elaborate further about his plans when he says, "And I have. Humiliating at first, but I knew he would let his guard down eventually. That he would come to trust I was under control." He will then once again tell you that the Forsworn are the victims when he says, "This was our land. We were here first. Then the Nords came and put chains on us. Forbid us from worshipping our gods." He will then end his speech with "Some of us refused to bow. We knew the old ways would lead us back to having a kingdom of our own. That is who we are. The Forsworn. Criminals in our own lands. And we will cut a bloody hole into the Reach until we are free." After you have spoken to Braig, Madanach will show some form of sorrow and remark, "Imagine hearing a story like that, over and over. Each time a different family [sic] Each time a different injustice. Your meddling above ground reminded me of how removed I've been from the struggle. My men and I should be in the hills, fighting." If you ask him that this means that you can finally escape he will remark, "Yes, but I need a show of loyalty from you. I don't need a shiv in the back while we break out." He will then make one final demand and say "Have you met Grisvar the Unlucky? He's rightly named, and he's also a thief and a snitch. He's outlived his minor usefulness. Take care of him, and then we can leave Cidhna Mine for good." If you gave the previous shiv to Borkul you can ask Madanach about a shiv to kill Grisvar "Ah, Borkul muscle one out of you on your way in? Fine. Take this one." Once you have taken care of Madanach's little problem he will say "You've finally become one of us. Come with me. I think it's time I announced my plans to you and your new brothers." he will then run to the campfire in the main chamber where all of his fellow prisoners will be waiting. Uraccen: "What's going on, Madanach? You wouldn't have old Grisvar killed unless you weren't planning on needing him." Madanach: "My brothers, we have been here long enough. It's time to leave Cidhna Mine and continue our fight against the Nords. Through this gate, just beside my quarters, is a tunnel. A tunnel that leads right through the old Dwarven ruins of Markarth, into the city. Well, what do you say, my brothers?" After he gives a short speech he will then tell you that you can leave with him and remark, "I say you've earned an early pardon. Let's go." You will now be able to escape from Cidhna Mine. Asking where the tunnel came from will lead to him telling you, "It's a little gift from the dwarves. Who knew they would end up helping our cause? We have to move. We'll talk more once we see the sky." As you reach the end of the tunnel Kaie will be waiting for you. Kaie: "Madanach. I've brought what you asked for." Madanach: "Good work. Get ready while I have a word with our favorite outsider." Madanach will then approach you one last time saying, "I had Kaie recover all the things the Nords stole from you. You better get ready before we break out into the city. And take this. It's blessed with the old magicks. Something to remember me by. Time to finally see the sky, and make it rain red." 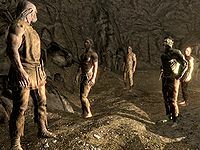 Before Madanach exits the tunnel and makes his escape across Markarth you can ask him what happens next. "Now? I announce to all of Markarth that I have returned. Don't worry about your name. They'll know who to blame and fear after today." He will then promise to continue the war by remarking, "It'll take years, but I'll organize the Forsworn again. We'll reclaim our land, and then, when power is ours, we'll have peace. A kingdom. Until then, let me offer you a warning. Beware the Forsworn. No place in the Reach is safe from us now." If he survives after you complete the quest No One Escapes Cidhna Mine, he will go to Druadach Redoubt along with his fellow escapees. The generic Forsworn at that location will also become friendly after this quest is completed. If talked to at this point, Madanach will remark, "Ah, my friend from Cidhna Mine. Hello. This is where it will begin. A new uprising." and '"We'll have our freedom. One day." This page was last modified on 18 October 2018, at 03:46.